On Sunday, Pennsylvania Governor Tom Wolf signed a new medical marijuana legalization bill into law. You can read the full text of the law, Senate Bill 3, here. Of interest to Lawffice Space readers, the new law contains some employment provisions. The gist of these provisions is that employers may not discriminate or retaliate against employees who are "certified to use medical marijuana" - not to be confused with recreational users. Employers are not required to allow marijuana use on their property or place of employment. Employers may still discipline employees who are under the influence in the workplace . . . "when the employee's conduct falls below the standard of care normally accepted for that position." Finally, the employer does not have to do anything that would violate federal law. 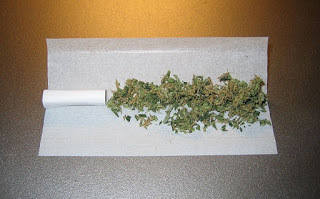 Unrolled marijuana joint. Public domain. (1) No employer may discharge, threaten, refuse to hire or otherwise discriminate or retaliate against an employee regarding an employee's compensation, terms, conditions, location or privileges solely on the basis of such employee's status as an individual who is certified to use medical marijuana. (2) Nothing in this act shall require an employer to make any accommodation of the use of medical marijuana on the property or premises of any place of employment. This act shall in no way limit an employer's ability to discipline an employee for being under the influence of medical marijuana in the workplace or for working while under the influence of medical marijuana when the employee's conduct falls below the standard of care normally accepted for that position.